1, Beam carrier field: Traditional beam carrier’s core components is using traditional slewing ring product mostly, compared to the rotary gear drive, the old one has no slewing bearing housing, and corrosion resistance is bad. 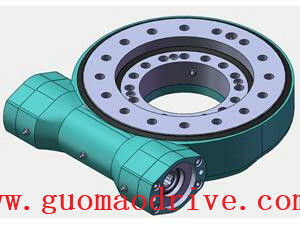 Moreover, by the hydraulic cylinder to push the tires steering systems, tire rotation angle is in a very limited range. Using the rotary gear device as a rotating part, not only can improved the corrosion resistance, also increase the steering angle of each set of tires. 2, Aerial field: Aerial is an important field of using rotary gear drive and the aerial device usually requires a higher safety factor. 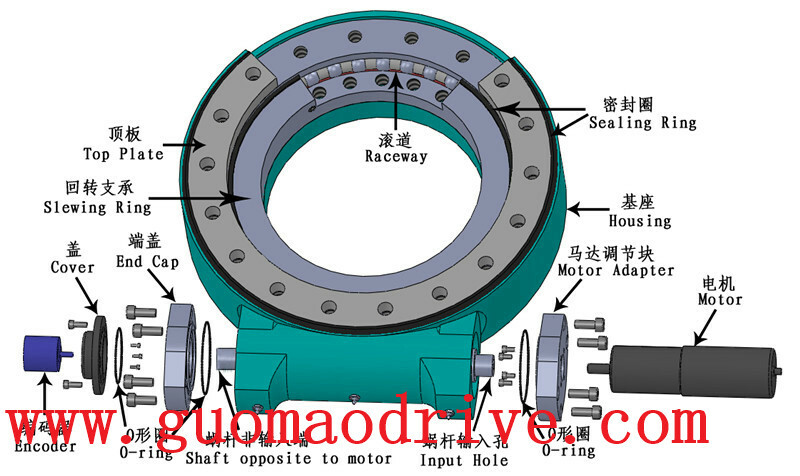 (self-locking worm) rotary gearbox’s the majority factor for users to choose is its high security. On the other hand, worm gears have a wide transmission ratio. 3, The Photovoltaic field: Photovoltaic power generation is an important application of rotary gearbox, using slew drive as a rotating component of solar PV modules, it can adjust a the precise angle according to the position the sun with a different location ,in best reception angle. 4, The wind power generation filed: Same as the Photovoltaic field, rotary gear drive can be used in wind turbine and achieve the level of organization of 360 ° rotation, in order to better adjust the angle of the receiver. 5, Construction machinery claws filed： Engineering machinery filed is a new important application area for slew drive. Using rotary gear rotating mechanism as grippers, making the structure, design more compact and more conducive to maintenance. In the same time, it has a large wide gear ratio which makes positioning of grippers and other construction machinery accuracy greatly improved.